Plan 9 from Outer Space is often touted as ‘The Worst Movie Ever Made.’ I think even the most causal perusal of films like, The Creeping Terror (1964), Heavy Metal Massacre (1989), or the entire output of Jerry Warren, demonstrates that this is patently untrue. 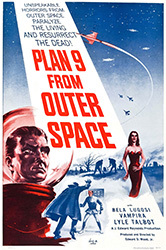 Plan 9 from Outer Space is filled with flaws, but there is an undercurrent of passion running through it. The charm of Plan 9 is in watching a small film reach for big things and constantly fail, but never stop trying. That is the key that elevates it from parody movies that try to deliberately ape its shortcoming for comedic value. Those kinds of films want to be little more than a few laughs, Plan 9 generates bathos from striving to be more than it is. Ironically, it has become more, the film is now ingrained forever as part of the cultural landscape. This is no small part due to the rise of VHS and Tim Burton’s portrayal of Ed Wood’s life in Ed Wood (1994). "We really should have called each other about what we wearing to work today." Flying saucers are spotted over Hollywood! One particularly nasty customer lands near a graveyard where it resurrects a recently deceased woman (Vampira) and her husband (Bela Lugosi). These zombies kill police detective Clay (Tor Johnson), who also rises at the behest of the aliens. Local squared jawed hunk, Jeff Trent (Gregory Walcott) investigates, only to discover that aliens are raising the dead to warn us away from developing the ultimate weapon, the Solaronite bomb, which is capable of destroying the universe. Things kind of go downhill for everyone shortly after that. Taking more than just a cue from The Day the Earth Stood Still (1951), Plan 9 wants to discuss the threat of atomic war and mankind’s self-destructive tendencies. 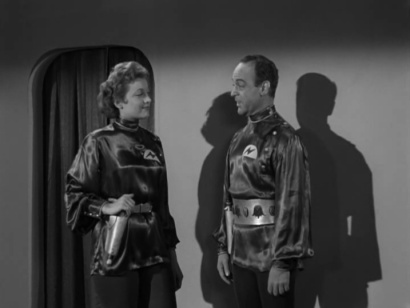 Where The Day the Earth Stood Still uses a somber formalism, Plan 9 employs stilted actors and almost incomprehensible dialog. Although the film, Ed Wood, would have us believe that the director was earnestly serious about everything that happens in the film, I would say the opening and closing narrations by Criswell i.e., “And remember my friend, future events such as these will affect you in the future,” lead me to think he at least had enough self-awareness to inject some knowing humor into the story. Tor Johnson has a vision of starring in The Beast of Yucca Flats in the future. 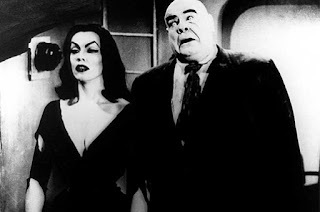 There is a lot of fun to be had in watching Tor Johnson and Vampira stumble around menacing some cops. There’s even some joyful subversion in seeing the dull straight-as-an-arrow hero get shown up by the much more melodramatic and sympathetic alien, Eros (Dudely Manlove). The wobbly sets, the cheap model UFOs, the mountains of stock footage are all pretty common elements in low budget SF, but here they manage to mix with the odd acting and dialog in just the right way to make something that is sublime. Plan 9 from Outer Space is a weirdo masterpiece. Thank you Ed Wood Jr.